Обратите внимание, мне выпала игрушка Необычный компас, которая падает с рыбного дейлика в даларане. 1Первое и самое важное этот айтим можно вылодить только после постройки Рыбацкая хижина 3-го ур. Стоит заметить что с него так же могут выпать Счастливая монетка Ната за которые вы можете выкупить у Нат Пэгл различные фишки. P.S. Выловил черепаху с 17 Карпа. Наличие/отсуствие наживки для определенного типа рыб не влияет на шанс ловли. После патча 6.1 с мурлока так же падает мясо различных рыб и первобытный дух 20-25 штук. Королевский червяк более не падает. Возможно бред, но я заметил что если не копить их, а призывать сразу как выловил по 1, то ловиться они будут быстрее. Проглядел комменты, для меня они несколько без полезны. Простой флуд. Вот пишу по делу. Бывает в течении 10-20 минут 1 рыба. А бывает за 10 минут ловлю сразу 5+ рыб. Общий дроп, примерно 2 рыбы за 10 минут. Так же применил приманку Шляпа со щупальцами . ТАк же использовал разную наживку, дабы с пользой ловить рыбёшку и выставлять её на Аукцион. Итого, навык рыбной ловли у меня был 1 100 очков. Е:) Чем выше навык, тем чаще ловится эта зелёная Карпишка. Просто ловил рыбку на дейлик и выпал Карп Зашедшей Луны, даже не знал, что он существует, зашёл сюда, узнал про черепах и стал ловить дальше. Чужой человек может ловить у вас в гарнизоне, как вы в его. Также дроп видят другие люди. Верховой черепахи пока нет, продолжаю ловить и надеяться. Once you've upgraded your Fishing Shack to Level 3 you can catch fish that summon mobs. I just upgraded my shack today, on the beta server, and caught one of these special fish, a Lunarfall Carp (I also got Nat Pagle as a follower but that's another story). Right click the fish in your bags to throw it in the water and summon a Lunarfall Cavedweller. It's a deep sea murloc, Level 100, non-elite, and not too hard to kill considering I had my fishing gear on. Once you kill the murloc it drops a lot of loot. Mostly fishing related stuff. Standard Disclaimer: This is from beta testing and is subject to change before it goes live. Using any kind of bait doesn't impact the chance of fishing the Lunarfall Carp. Drops Nat's Lucky Coin .... got 4 but it's not guaranteed... however when you get them it's 2 per fish. Out of 10 carps I got 4 coins... Still better than lunker fish. Update: I fished up quite a few of these guys since I last posted. I got 4 more Nat's Lucky Coin (2 per cave dweller). After that, no more coins. Not sure if the weekly cap is 4 from this method to prevent people from sitting in their garrison and farming or what... I stand by getting coins this way (at least up to the cap if there is one) for some easy coins. I just looted a Морская черепаха from the Cavedweller that spawned for me and gave me the achievement Покатай меня, большая черепаха!, I was super stoked. These can be caught while in a raid group. if you aren't catching one, it's just bad RNG. Happy fishing! Fished up a Карп Зашедшей Луны with 800 skill in about 15 minutes. Just so you have an indication of how much patience you need. I caught my second Карп Зашедшей Луны much, much faster. I needed less than 7 minutes. During the last minute, I was wearing Шляпа со щупальцами and reached 900 skill. Then I continued to fish for another Карп Зашедшей Луны, and it took me another ~ 15 minutes again, still wearing that ridiculously awesome looking Шляпа со щупальцами. I've caught 65 of these so far in my quest to get the Riding Turtle. I'm currently sitting at about 1.5% catch rate in my garrison at 1100 fishing skill, so I'm guessing the wowhead catch rates are not accounting for people fishing with level 1 or 2 shacks. I might be getting lucky but I'm guessing the catch rate is at least more than wowhead's 0.5%. Карп Зашедшей Луны is catched while being in your Alliance garrison (even outside the walls, if you are still in garrison zone) if you have upgraded to Рыбацкая хижина 3-го ур..
You can only have up to 5 Карп Зашедшей Луны at a time. The Horde equivalent is Ледоспинка студеных глубин which spawn Обитатель ледяных пещер. I spent about 90 min fishing, approx. half of that time with Nat Pagle assigned to the shack, and got 0 Carp. Disappointed to say the least. Outside of the level 3 fishing shack requirement, is there a minimum fishing level to catch Lunarfall Carp? Just got my first Lunarfall Carp after about 45-50 casts with no extra buffs or hats or special fishing pole. Or without Nat being assigned to my Fishing Hut. So even at "just" fishing 700, you should get the Carp. Don't forget to sell your Baits (and fish) in the AH. On my server the Baits get about 5-15 gold. PS - there is actually some Garrison Resources in the Cave! The NPC Scrap Sparkfuse hides his stuff in there. If you are farming these, make sure a patrolling follower isn't nearby when you spawn the cavedweller because they will run over and attack it, thus rendering your kill lootless. So after around 24 kills of the Lunarfall Carp. I got my Sea Turtle! I only need the Riding Turtle now! So, I attached Nat Pagle to my fishing shack on my main the minute I had him as a follower. I spent the next two weeks doing the fishing dailies in my garrison, and didn't fish up a single Lunarfall Carp (I spend ~10min fishing, using appropriate bait, usually using a lure, to complete the daily and have some extra fish leftover). I probably skipped a couple days here and there, but at least ten 10-minute fishing sessions yielded no carp with Nat. I took Nat off my fishing shack, and caught a Carp the same day. On an alt, I opened a fishing shack, got Nat, and didn't attach him to the fishing shack. I've done the daily quest on her as well, and have gotten 3 Lunarfall Carp in the last week or so. However, I just spoke with a GM, and he said that Nat's attachment to the fishing shack shouldn't affect Carp catch rate, and that there are no bug reports on this subject, so I probably just had bad luck. Anybody else have the same bad luck as me? or anybody manage to catch Carp with Nat? The drop rate for these seems to have been drastically increased with 6.1.... I went from going 2 hours without a single one, to getting at least 1-2 every 20 minutes or so. I just fished up 3 Carps, one after the other.. 3rd one produced the Верховая черепаха for me! Prepare yourself for a lot of Огромная рыба-сабля if you're farming this. Does anyone know if I can fish up one of these in someone else's level 3 shack but don't have one of my own? I downloaded the Fishing Buddy addon to track the drop rate for the Lunkers and Lunarfall Carp. With the Lunkers I was averaging around 3% drop rate on average. I have made my 1,000th cast since I downloaded the addon at the Lunarfall level 3 Fishing Shack and had caught 33 Lunarfall Carp out of those thousand casts. I hope this information is useful to people that are wanting to farm the Lunkers and Carp. Sometimes I'll get 5 of these in 10 minutes, and sometimes I'll only get 1 in 20 minutes. RNG is a crazy ^&*!@. Note: Once I realized that you could catch the Lunarfall Carp even when you had bait attached to your pole I always had a Sea Scorpion Bait attached so that i could make a ton of healing pots for my guild while farming the Carp. Does anyone know if you can get lunkers while fishing for these? Can others fish Lunarfall Carps in my Garrison, if my fishing shack is lvl 3? The RNG on this thing is very tricky. Sometimes I will fish for a half hour and get 1 or 2 Карп Зашедшей Луны, then on the 2nd half hour I'll get like 4-6 Карп Зашедшей Луны. If you want consistent coins, I would say go fish lunkers. But If you want a chance at the mount and coins, this is it. I sat down to see what I could catch, so far in about 20 min the noteable things I've gotten are the unusual compass and several of the fishing hats off 3 of the cavedwellers. I just got my Морская черепаха at 37Карп Зашедшей Луны so they still drop at 6.2.3! I keep fishing until i get my Верховая черепаха! 26 casts so far and nothin am I doin somethin wrong? I know rng but from what ive read this is bad. After upgrading to lvl 3 fishing shack and having fishing lvl at 185 I just fished up my first Карп Зашедшей Луны. It came after 10 casts or something like that. After 2000 casts at a fishing skill of 1100, my catch rate for Lunarfall Carp was 4.8%. if u used 2nd one while a mob is up, 2nd one will not spawn! I caught this fabulous fish when sitting at 195 fishing skill after fishing from 1 to 195. I guess higher fishing skill would increase the chance, or there is a fishing skill requirement to catch this? So I just read about these fish, knew nothing of them before today. Thought I'd give it a go. So off to the bank to get my fishing gear, 730 fishing . CONFIRMED MOUNT DROP PATCH 7.0.3. Just looted Верховая черепаха on pre-patch 7.0.3. from the Cavedweller after 8 - 10 hours of fishing in my garrison. You can still do it, guys! With Patch 7.0.3, Everyone can loot Обитатель пещер Зашедшей Луны's drop, It is like Personal loot now! (That was only person can loot per cavedweller before the patch). Create your own group or Join the group, try your luck for find Верховая черепаха and Морская черепаха! Personallly, I found Верховая черепаха today, after spending 3-4 hours with fishing. Do I have to be in a group or can I just fish myself? will this be going away when the expansion drops? 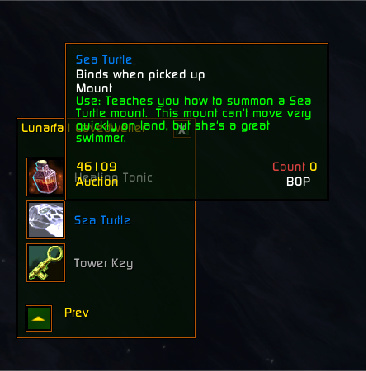 First Lunarfall Carp, get the epic turtle mount. Already had the sea turtle so didn't get the achievement but wootastic nonetheles. In case anyone worries if it changed with Legion, I just fished one up 9/5/16 so it is still in place. Which gives +330 to fishing. This is in Legion, so with max fishing, this gave me a total of 1130 fishing skill. So I had a clean 4.0% chance of the Lunkers! The statistics for this are in fact incorrect. It may be 1.9% for people with fishing level 1 which is ridiculous because you have to catch a minimum of 700 fish just to have access to the carp. For 100 Lunarfall Carp it took me 2185 successful casts at a rate of 4.6%. I caught that with the use of my already level 800 fishing skill, 1 supreme worm per 10 minutes (you get them back from the carp in a larger quantity than you use), the squid hat thing and the ephereal rod. Altogether a skill of 1200. I don't personally have any idea if raising my skill even affects the catch rate but that's just what I found. I've found that it's not even worth it to bother using the "Vial of Poison"s as the quest master isn't even in the sewers half the time. If you are going for this fish then I'm going to assume you are after the Sea Turtle / Riding Turtle / Weather beaten fishing hat as I was as not really any point farming this for gold. I came back to post this as I would have wanted someone to do same for me. Evidence of this in screenshots. I planned on posting here once I hit 1000 casts with my drop rate for Карп Зашедшей Луны, but I got quite lucky and got my riding turtle before then. In total, after I started using fishing buddy, I recorded 584 casts. During that time, I caught 25 carp, for a 4.3% drop rate. (Unfortunately for the carp I caught before that, I did not have the addon installed.) My adjusted fishing skill was at 1200 (level 800, plus an Эфемерная удочка, a Шляпа со щупальцами, and Королевский червяк as bait). From the same 25 carp, I received a single Необычный компас and 12 Счастливая монетка Ната. The only other item of any potential interest was a single Узорчатая пивная кружка. At the time of this posting, these may be unobtainable, at least for now. With the 8.0 changes to professions, WoD fishing caps at 100 and even with 130 fishing with lures and gear, I am only able to fish up small and, rarely, regular fish, instead of the enormous fish that were obtainable before the change. Blizzard appears to have not lowered the skill cap on these and possibly lunkers with the changes. Hopefully this gets looked at soon. EDIT: These are dropping although they seem more rare than the previous catch rate. I feel strongly that this is tied to actual fishing skill for the area. I don't have much in the way of stats but it "feels" like I catch more the higher my skill is. The jump from 120 to 135 with equipment felt noticeable. Drop rate seems to have changed from before 8.0, was catching on average 5 per hour, have been currently fishing for 3 hours and have not had one drop. May have just been unlucky but i'll keep trying. Something seems to be fishy with the drop rate for these since 8.0. They do still drop, as I have been able to catch one, but that was out of close to 600 casts. My fishing prior to patch 8.0 was (and technically still is) maxed out, and I was using fishing enchants (hat/artifact pole with enchant and bait)- but I am guessing that since the profession change (where skills were broken down by expansion and now cap at 100 for each), something isn't working quite right with the lunarfall carp and I'd assume the horde equivalent (Ледоспинка студеных глубин) - since catching these rely on your fishing skill relevant to that expansion. Этот предмет может быть выловлен в Зашедшая Луна (38).